Die Bügelstation weist nur leichte Lagerspuren am Gehäuse. Die Sohle befindet sich in einem TOP-Zustand! Kontrollleuchte für leeren Wassertank. Dampfdruck 5 bar. Vertikaldampf: ja. Aufheizdauer: Bügelbereit in 2 Minuten. Variable steam function allows you to adjust the humidity, direction and power of the steam flow. Cordless function. Steam output: 25g/min. Shot of steam: 115g/min. Features a steam tip for easier removal of creases from difficult to reach areas. Virtuo also has a non-stick PTFE soleplate for smooth gliding and effortless ironing; it’s bigger too, so it covers more fabric in one stroke for speedier results. Finally, this steam iron has an ‘Eco Mode’ to cut energy use by up to 20% , plus smart auto-off function for safety. Tefal PRO EXPRESS Steam Generator GV8110. Condition is Used. Dispatched with eBay delivery – Shutl 2-3 days. The Breville® VIN393 PowerSteam iron is designed to make ironing as effortless as possible. The ceramic soleplate glides over your fabrics for quick ironing that doesn’t burn or mark your clothes. 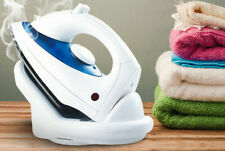 The combination of 2400W powered heat plus 40g of continuous steam makes it easy to iron out creases on all fabrics. Tefal FV 4680 Dampfbügeleisen Ultragliss neu. Gerät unbenutzt und absolut in Ordnung. Die Hände sind zum Bügeln frei?. Das Kabel berührt das Bügelgut nicht?. Optimale Kabelaufwicklung / Integrierte Anti-Kalk-Kassette / Zweifarbiger ergonomischer Softgriff / Selbstreinigungsfunktion / Extra große Einfüllöffnung zum einfachen Befüllen / Offenes Heck für stabile Ablage während des Bügelns / Wassertank 300 ml / Spray / 2300 Watt / Farbe: Türkisblau. Introducing you to the future of ironing with – the One Temperature Iron. With one optimum heat that’s safe to use on all iron-able fabrics – ironing can now be easy and effortless. Designed to leave you going full steam ahead with your ironing, you can smooth away every wrinkle, crumple and crease in your fabrics. Ein-/Ausschalter, Temperatur-/Dampfbereitschaftsleuchte. Kontrollleuchte "Entkalken" und "Wassertank leer". Höchster Komfort für schnelle Bügelergebnisse. Edelstahltank mit außen liegender Heizschlange. Tefal PRO X-Pert Plus GV8977. • Kontrollleuchte "Entkalken" und "Wassertank leer". • Ein-/Ausschalter, Temperatur-/Dampfbereitschaftsleuchte. TEFAL GV 8977 PRO X-Pert Plus Dampfgenerator Lila/Weiß. Hat leichte Lagerspuren am Gehäuse, Wassertank hat Riss, Wasser wird bis dahin nicht gefühlt. Wenn Sie schon vom "CLEANmaxx" Hemden- & Blusenbügler begeistert waren, kommt hier noch eine geniale Ergänzung dazu: Mit dem "CLEANmaxx" Hosenbügler-Aufsatz werden endlich auch Ihre Hosen auf Knopfdruck trocken und faltenfrei! 45 g/min continuous steam / 130 g steam shot. Vertical and variable steam. Non Stick Soleplate. Kirkwood Hospice. Light surface scratches & marks may be present. Item would benefit from a clean. We respect individual needs and wishes, caring for each person to help them achieve the best possible quality of life. Tefal GV8959 Dampfbügeleisen Dampfgenerator Dampfstation Pro Smart 7Bar 470gr ! 7 Bar Dampfdruck, Vertikaldampf. Automatische Abschaltung nach 8 Minuten ohne Gebrauch. Patentierter exklusiver integrierter Antikalk-Kollektor. • Zustand Abnehmbarer, transparenter XXL Wassertank (1,6 Liter). 1 x Handhold steam iron. This product can be used when the ironing machine steam ironing can also be iron when the ironing, compact and portable multi-functional design, suitable for single white-collar workers, often travel, travel preferred ironing tools. Genuine Morphy Richards Breeze 300253 Steam Iron -- new & sealed. The steam shot is ideal for tough creases or hard to reach areas, where the constant steam is better for the larger surface areas. Breeze through your family's ironing with this new 2600-watt iron, for fast heat-up and less waiting around. Tefal GV8931 Dampfbügeleisen Dampfgenerator Dampfstation Pro Express 6,5B 400gr! Produkttyp: Dampfbügelstation. Schnelles und effizientes Bügeln! Die perfekte Kombination aus Temperatur und Dampf für jede Stoffart. Dampfdruck: 6.5 bar. Dampfleistung (g/min): 400 g/Min. Hochdruck-Dampf: ja. Model Number GV8931. With one-touch settings and clever technology, Tefal have ensured that the Smart Technology range will provide the optimal balance of steam and heat, essential for achieving a crisp, crease free finish across all ironable fabrics and clothes, from delicate silk to stubborn denim. Tefal PRO X-Pert Plus GV8977. • TEFAL GV 8977 PRO X-Pert Plus Dampfgenerator Lila/Weiß. • Bügeleisen mit extra großem Heck für sicheren Stand und Easycord System. • Kontrollleuchte "Entkalken" und "Wassertank leer". Phoenix Gold FreeFlight can even steam vertically allowing you to quickly remove creases in curtains or freshen up clothes on the hanger. But, if 6 seconds is still too long, you can use Phoenix Gold FreeFlight while still attached to its dock, like a normal corded iron, for constant, non-stop steam power. Safe to use on all types of fabric including delicate clothing, drapery, furniture upholstery, bedding and table linens. The robust 360?. Need to freshen up an outfit fast?. For more intense sessions, the generous 2.5L water tank (removable for easy refilling) allows up to 80 minutes of uninterrupted steaming. no more wrestling the ironing board out of the cupboard! 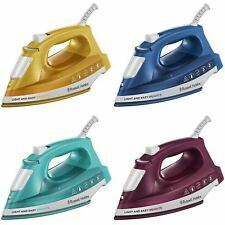 The Livington iron's silky-smooth Nano-ceramic soleplate glides over all kinds of fabrics, while its powerful, wrinkle-busting steam smooths out even the heaviest creases, helping you to breeze through that chore and get out the door! Steam Iron. 45 g/min Continuous steam. Steam Boost. 300ml Water Tank. Philips GC7805/20 PerfectCare Compact Steam Generator Iron GC7805/20. Condition is New. Dispatched with eBay delivery – Shutl 1 day. NON STICK SOLE PLATEM, STEAM 100grm SHOT. CONTINUOUS STEAM 40grms. WATER TANK 300ml ( WITH PLASTIC FILLER). Kernloch 13,2 mm. 230V/50Hz 17VA ED 100% Classe H.
Totally unused. Just what you see is what you get. 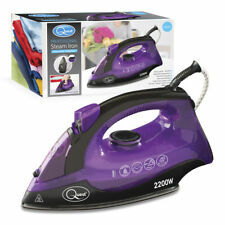 Tefal 3680 Superglide 2200 Watt Power Steam Iron With box. Condition is Used. Dispatched with Royal Mail 2nd Class. Klapptoaster 50er Jahre. ROWENTA TOASTER. NO MANUAL, BUT CAN BE DOWNLOADED ON INTERNET. BELOW IS THE LINK. GOODWAY New Steam Q2 Double-Hotplate Smart All-in-one Iron and Sterilizer 3Head GOODWAY New Steam Q2 Double-Hotplate Smart All-in-one Iron and Sterilizer 3Head. -Button steam Continuos Steam. -Hot plate type Steam type.